"Robert F. Kennedy asks Hon. Irving Ben Cooper for special treatment for an employee of his who has violated the terms of his probation." Irving Ben Cooper (February 7, 1902 in London, England – September 17, 1996 in New York) was a U. S. District Court Judge of the Federal District Court of the Southern District of New York from 1962 to 1996, having received a recess appointment from John F. Kennedy on October 5, 1961. In 1970, he presided over a claim that organized baseball exerted a monopolistic hold on all major and minor league teams, and in 1982, a complaint filed by Jacqueline Onassis that a photographer was harassing her and her daughter, Caroline Kennedy. He also held the position of Chief Justice in the New York Court of Special Sessions from 1951 to 1960, during which time he wrote yearly reports on the problems regarding the treatment of young offenders in the criminal justice system, asserting "It is not impossible for a sentence to be a greater injustice than the criminal act: equivalent to putting a child with a common cold into a smallpox ward for treatment." Cooper received his LL.B. from Washington University School of Law in 1925. His professional career included a private practice in New York City from 1927 to 1938, the position of Special counsel in the New York City Department of Investigation from 1934 to 1937. 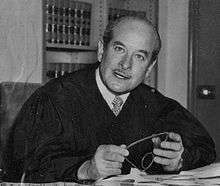 He was a New York City magistrate from 1938 to 1939, and an Associate Justice in the New York Court of Special Sessions from 1939 to 1951. From 1960 to 1961, he was a lecturer for the Menninger Foundation. Cooper's nomination to the Federal Bench was controversial. Attorney General Herbert Brownell spoke out and said, "If there was ever a justice who was not deserving of this appointment, I submit it is Irving Ben Cooper." Irving Ben Cooper at the Biographical Directory of Federal Judges, a public domain publication of the Federal Judicial Center.